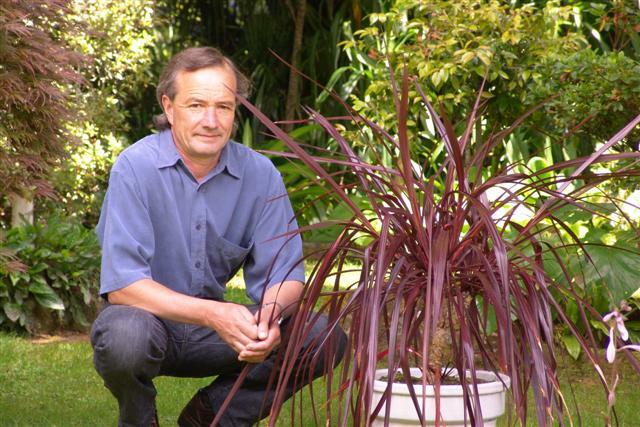 For an update on the status of Cordyline Red Fountain and the ring-in, please check out “A Tale of Two Plants“. A number of Felix Jury deciduous azaleas have been sold on the NZ market over the years. Felix had a preference for the subtler colours and pastels and this is reflected in some of the cultivars he named. Almond Icing – delicate pale apricot with buff overtones. Subtle and unusual. Apple Blossom – full truss of soft shell pink frosted with darker pink and golden overlay. Upright habit. Cream Bun – cream suffused pink with yellow throat. One of the most fragrant. Forest Fire – burnt orange to red. Fruit Salad – free blend of fruity colours – yellow, orange and pink. Mimosa – large apple blossom pale pink and cream blooms, sweetly scented. Named for Felix’s wife, Mimosa Jury. Primrose Brook – large flowers in pale primrose yellow and compact growth. Tangerine Queen – rich, plum tangerine tones on a tall, upright grower. Val’s Choice – extremely large flowered bright orange. Named here for a long standing and loyal staff member, Valmai Brinkley. White Delight – large, fragrant flat flowers in creamy white with a yellow centre. In recent years, Mark has been playing with arisaemas to get hybrids which will perform well as garden plants with their hooded flowers held above the foliage as well as with an extended colour range. Without much of a winter chill, we struggle with some of the choice species here and have to work to keep A. sikkokianum happy in the garden. However, Mark’s hybrids have proven to be a fantastic feature from spring to summer. We have so many of them used as woodland bedding plants that some garden visitors are inclined to think that they should be able to buy a punnet of six plants for about $2. 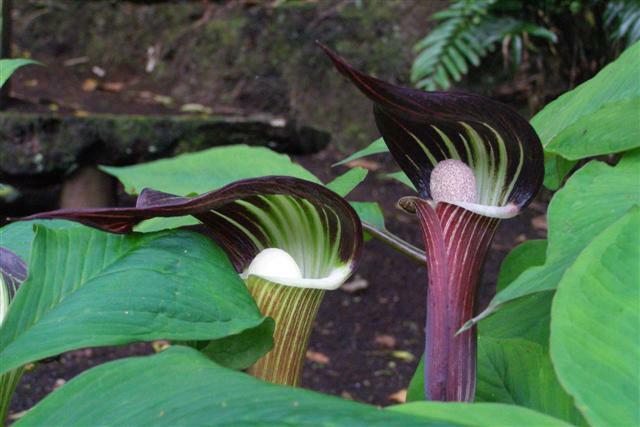 We have never sold any of these arisaema hybrids and have no plans to in the immediate future so at this stage they are unique to our garden. Felix worked with auratum lilies to generate better performing garden plants rather than blooms for floristry. All are heavily scented with very large blooms and have been sold by name in the past. The auratums are a mainstay of our summer garden and just keep on performing with very little attention – though we are trying to do a dig and divide round on the overgrown clumps this year. Auratum Golden Harvest – Very large white bloom with a wide golden band. Strong performer. Auratum Betty – Large white with a yellow centre. Auratum Flossie – Large attractive pink. Auratum Milady – Huge soft lavender pink flowers with a green centre. 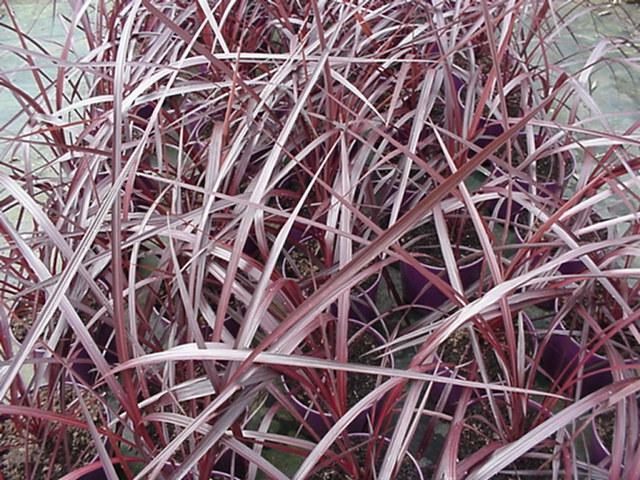 Auratum Satan’s Breath -Deep mahogany red centre with a pale creamy white background. Auratum Summer Charm -Very large white with a central band of deep vermilion. Auratum White Heron – Absolute perfection in large pure white. Lachenalia reflexa hybrid – for the record, a Jury selection chosen for its near pure yellow colouring (just a smidgeon of orange red at the perimeter of some flowers) and its vigorous habit. Reflexa is the mother, it is likely that aloides was the pollen donor. With our difficulty in naturalising narcissus here, we were looking to the reliable lachenalia to give him good yellow colour for spring drifts. We have sold this selection for a number of years simply as a reflexa hybrid but we have since seen something which looks very like it advertised under a cultivar name and we suspect it could be one and the same. The autumn flowering nerines are a rewarding feature in our garden here and both Mark and Felix have dabbled in extending the colour range and form, particularly in the sarniensis hybrids. Felix liked the subtle, smoky colours whereas Mark is looking for reliability as garden plants and something new in colour or form. To date, only three have been named and sold though there of selections of considerable merit in the garden here. Nerine Coral Star (Mark Jury). Large bulbs produce tall flower stems with large blooms in soft coral salmon tones with white stripes and markings. Nerine Nelson’s Blood (Felix Jury). Deep red with purple borders. 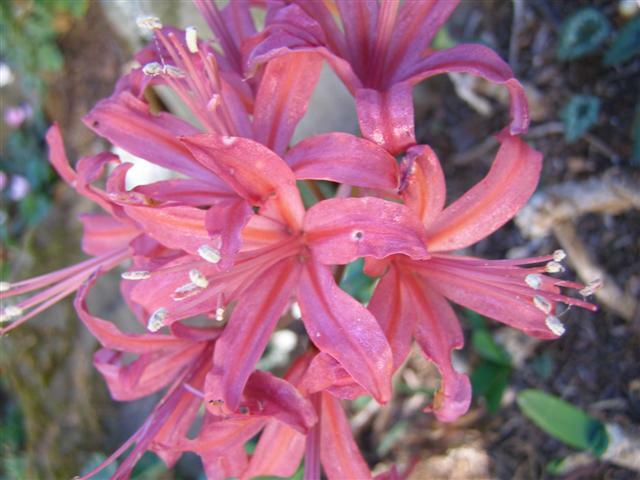 Nerine Smoky Queen (Felix Jury) Light pinky purple with smoky overtones in subtle and unusual colouring. 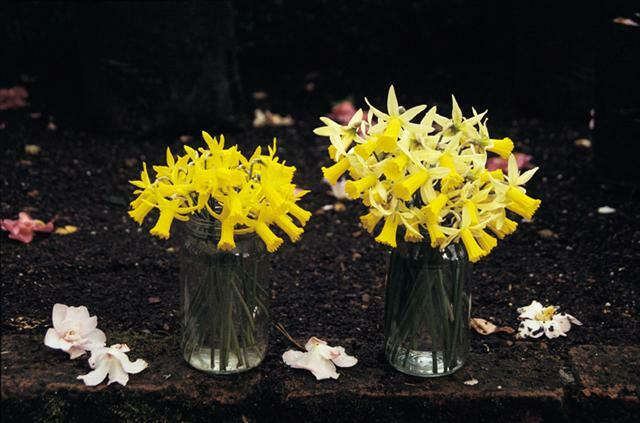 Felix had a longstanding love for miniature and dwarf narcissus, particularly cyclamineus types. 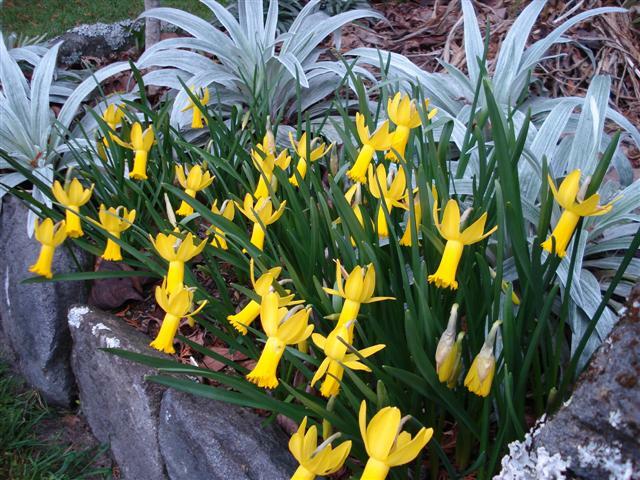 In a climate where we struggle with larger growing daffodils because of our fertile conditions allied to the pesky bulb fly, we find the dwarf forms are more reliable as garden plants and in early spring our rockery is full of these treasures. Felix only ever named two, although we have various different selections of merit growing nearby. Narcissis Twilight (Felix Jury). Dwarf cyclamineus hybrid with slight reflex perienth, yellow trumpets with lemon petals. Particularly good performer. Narcissus Twinkle (Felix Jury). The sister to Twilight but this time with matched yellow trumpet and petals. No celmisia selections from the breeding programme here have ever been given a cultivar name but there has been an ongoing breeding programme running here on these charming NZ native mountain daisies. The challenge is to adapt a perennial alpine plant to conditions which are humid, temperate to subtropical with relatively high rainfall. However, we have managed to keep them going in the garden here for nigh on forty years by crossing different species to get hybrid vigour and adaptation. There is a wide range of leaf width seen and variation in the level of the desirable silver sheen. Mark and Felix spent some time using with a pink toned flowering form found in the wild, working towards pink celmisias but these days we are just grateful for selections which will tolerate our conditions and stay alive and growing (as with meconopsis). HOSTAS – all by Felix Jury. Blue Cup – a selection of seiboldiana, raised by Felix and picked out for its distinctive rounded leaf which incurves to the point where it will hold water. Typical heavy textured blue seiboldiana with white flowers. Blue Horizons – medium sized grower, chosen because it retains its silver blue colouring throughout the season. Somewhat pointed and ribbed foliage, shows good slug and snail resistance. Cream Edge – chartreuse yellow leaves with neat white margin, very regular and quite narrow. Leaf is inclined to be rather soft but the clumps build up well for good display. Medium size. Blue flowers. Goldrush – Felix’s biggest and best gold, opens lime green and turns gold as spring progresses. Larger grower. Exceptionally good floral display with purple flower spikes. Eyecatching, lighting up darker areas and easily the most successful of Felix’s hostas. Silver Spoon – This small growing silver blue hosta with spoon-shaped leaves has a near metallic sheen. Slow to increase so never widely distributed. 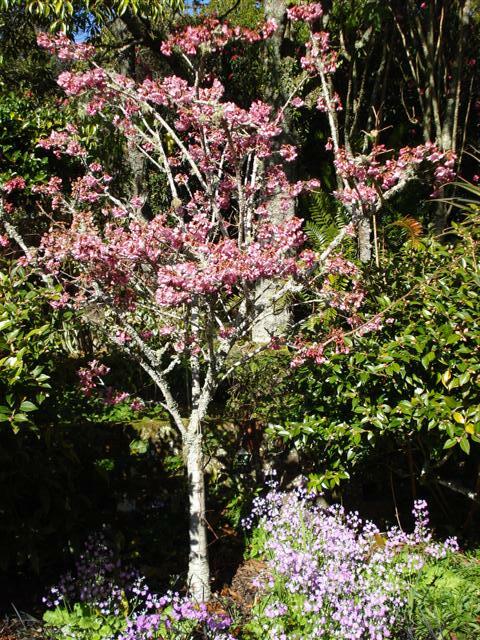 Felix’s interest lay in the Taiwanese or campanulata flowering cherries, much favoured in warmer parts of NZ because the flowers feed the native birds in late winter and early spring. Our highly prized tui are territorial birds and at times in spring, it can appear as if a single tree is exploding with scores of these iconic but bickering birds. The Japanese cherries are less successful in our climate, being short-lived (they don’t appreciate our damp winters and succumb to root diseases) and inclined to witches’ broom. Prunus campanulata Felix Jury – this deep carmine red bloom on a smaller growing, narrow tree was released by Duncan and Davies and named for Felix by them because he was the originator of this selection. It is still the darkest campanulata variety we know of on the NZ market. 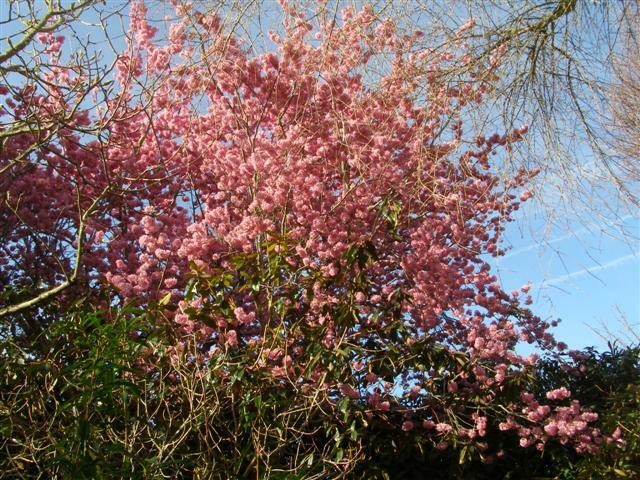 Prunus campanulata Mimosa – rich pink flowers borne in profusion. Vigorous and upright to spreading growth. This was clearly one of Felix’s favourite selections because he named it for his wife. Prunus campanulata Petite Pink – a campanulata hybrid and a true dwarf reaching around 2.5 metres only (as compared to others which quickly grow to double or even treble that height). Small clusters of carmine pink bell flowers. Compact habit. Prunus campanulata Pink Clouds – early flowering bright pink single with petalloids. Forms a graceful, pendulous tree. For the record, Prunus Pearly Shadows is a very pretty full frilly double Japanese cherry which Felix named but did not breed. The origin of the original plant here is now unknown but it is too good to be a chance seedling and it is likely that this cultivar is sold by another name overseas.